Chop onions and mince parsley and garlic. Mash together ground beef with onions, garlic, and parsley. Stir in spices, egg, and breadcrumbs. 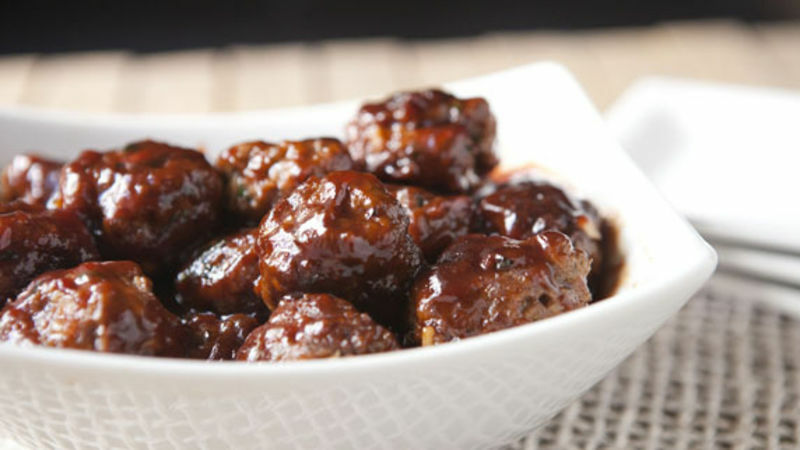 Shape meatballs into about tablespoon-sized balls. Roll them gently so they are the same shape and save them on a baking sheet until you're ready to cook them. When you're ready, add 1/3 cup oil to a large skillet over medium-high heat. Add as many meatballs as can comfortably fit in the pan, but try not to crowd it. Cook the meatballs for about 8 minutes, turning regularly until they are cooked through. Meanwhile, mix together sauce ingredients in a medium pot over medium heat. Let simmer and thicken, stirring regularly, while the meatballs cook. The sauce needs to cook for at least 10 minutes. When meatballs are done cooking, transfer them straight to the sauce pot to coat well with sauce. When all meatballs are cooked and coated well with sauce, serve with toothpicks! When it comes to snacking, my favorite flavor profile is sweet heat. Take something slightly spicy and mix it with something slightly sweet and smash it together. It’s almost guaranteed to be good. These chipotle meatballs are obviously spicy (just by the name), but what you can’t tell is that they are coated in a sweet sauce that takes them to another level. Making meatballs from scratch like this isn’t a hard thing. It takes just a few minutes to mix and shape enough to feed a crowd, and people will be very thankful. These are the basics of any good meatball recipe. Lightly mash the ground beef with the onions, parsley, and all the other mix-ins. You do need some egg and breadcrumbs as a binder, but try to not add too much or your meatballs will be too bready. Oh… and the special seasoning: chipotle pepper powder. This stuff packs a punch so go light on it. One teaspoon is probably enough or you could add up to two if you really wanted to feel the heat. When the mixture is well-combined, shape the meatballs into tablespoon-sized balls (lightly roll them) and transfer the shaped meatballs to a baking sheet. To cook the meatballs, add the vegetable oil to a large skillet over medium heat. Then add as many meatballs as you can fit in the pan without crowding the pan, and cook them for about 8-10 minutes, turning occasionally, until the meatballs are well browned. Obviously the meatballs should be cooked through so feel free to cut into one to test if you have any doubts. Now onto that secret sweet sauce. It’s actually a dumb simple sauce but I promise that it’s delicious. The key ingredient is grape jelly. Just trust me on that one. Stir together the sauce ingredients and let it simmer on low heat for about ten minutes while the meatballs cook. When the meatballs are done, transfer them to the sauce and coat them well with the delicious sweet sauce. These meatballs need nothing else except a few toothpicks. If you are serving them at a tailgate or something, you can keep them warm in a crockpot… not that they will last that long. Nick can burn through a lot of toothpicks on these guys. Be sure to check out his blog, Macheesmo, and follow him on his Tablespoon Profile.